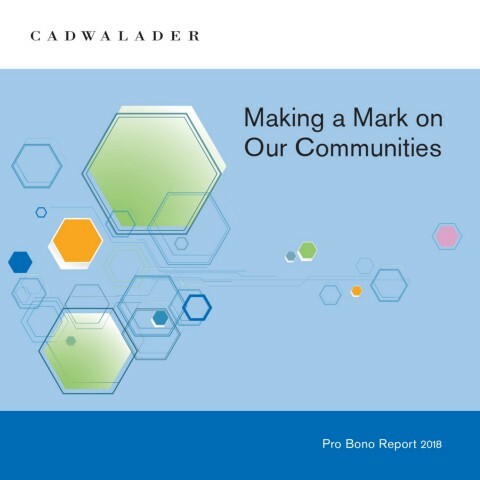 Cadwalader has been recognized with a number of awards and honors for its work on behalf of those in need. That's not why we do it, but it’s nice to get the occasional shout out. The Legal Aid Society’s Pro Bono Publico Award in 2014, 2015, 2016, 2017 and 2018 for outstanding service to The Legal Aid Society and its clients. Osvaldo Garcia, founder and director of the Cadwalader Black & Latino Association Immigration Clinic, was awarded the New York State Bar Association’s President’s Pro Bono Service Award and the 2016 Pro Bono Attorney of the Year Award by the Hispanic National Bar Association. In 2016, 2017 and 2018, our attorney volunteers were recognized by the NYC Family Court Pro Bono Project for their dedication and service.